Tasmania is a large island off the southern coast of mainland Australia. It is a state of Australia. Its capital and the largest city is Hobart. The island was joined to the mainland until the end of the most recent ice age approximately 10 000 years ago. It is the home of rare animals such as thylacines and tasmanian devils. Tasmania is a state of Australia. Unlike the other states, it is an island. The Bass Strait separates it from the Australian mainland. The first people to come to Tasmania were the Australian aboriginals. Aboriginals are the native people of Tasmania and have lived there for a very long time. Abel Janszoon Tasman was the first European to discover the island in 1642. He called it "Van Diemen's Land". It was later called Tasmania. Much later, people came from Europe, mostly from the British Empire, to live on the island. Tasmania has four cities: capital city Hobart, Launceston, Devonport and Burnie. Tasmania is the smallest state in Australia because it takes up a small amount of area. It also has the smallest population. 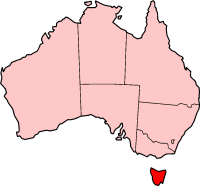 The total population of Tasmania is just over 500, 000 (May 2008). Errol Flynn - actor, best known for his role in the 1930s as Robin Hood. This page was last changed on 24 January 2014, at 01:00.